ICPRD sought for building a network of parliamentary advocates for development through exposing Members of Parliament (MP) and legislators to ground realities across the country. These exposure visits have been highly successful and have led to an interface between civil society and parliamentarians and legislators. In India, this is the first time that a NGO has taken up such an effort successfully. ICPRD’s tally as of now is 70 MPs in its last several years in its 600 events. 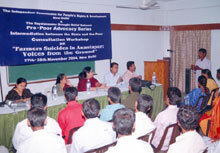 A public hearing titled, ‘Voices from the Ground’ was organized by the ICPRD NGO network. Eleven suicide victim households, 5 landless labourers and trafficked women from drought prone Rayalseema region of Andhra Pradesh shared their experience at the Planning Commission panel. 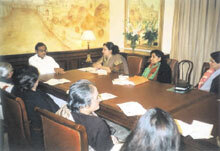 This was the first time that the victims’ families got opportunity to interface with the policy makers. As a first for India, in its micro-finance advocacy campaign in Jharkhand, ICPRD facilitated the preparation of its field training manual on SHG group formation in local Santhali language to reintegrate tribal women into financial institutions. 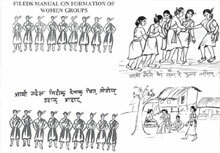 The manual for management of indigenous women’s groups has pictorial representation of social mobilization concepts to reach out to the tribal women. To link them to the formal banking system, ICPRD also facilitated the preparation of SHG Bank linkage forms and other necessary banking formats in Santhali language as promotional ventures. Through these activities the indigenous women were capacity built to address agricultural distress in their communities. 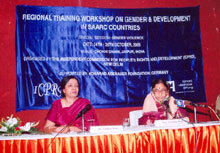 ICPRD held two SAARC Regional Conferences and Training meeting on issues of Gender and Poverty, and Gender and Development. The Conference on Gender and Poverty, titled ‘Poverty and Gender Issues in the SAARC Region: A Dialogue among NGOs and Parliamentarians’, was the first in which SAARC Members of Parliament participated. The Hon. Home Minister of India, Shri Shivraj Patil, inaugurated the event. The Deputy Chairperson of the Planning Commission gave the key note address, Ministers for Women and Child and Planning also participated as speakers along with other prominent MPs. SAARC MPs from Pakistan, Bangladesh, Sri Lanka, Maldives also participated. ‘The SAARC Regional Training Workshop on Gender and Development’ was focused on GBV with participants from SAARC countries’ civil society institutions. 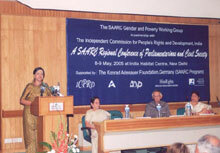 Then Governor of Rajasthan, Smt. Pratibha Patilji (later elected first woman President of India) gave the valedictory address. ICPRD was one of the first NGO networks to conduct a study and call for a review meeting of Tamil Nadu NGOs on Tsunami relief in Cuddalore in January 2005 to monitor challenges and analyse progress of relief work in the aftermath of the December 2004 Tsunami. Two advocacy papers were submitted to the National Advisory Council (NAC) on the Tsunami Disaster Management - strategies and solutions. 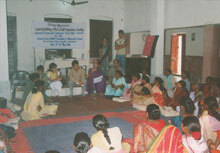 Since 1998 the ICPRD initiated its microfinance advocacy campaign for poor and tribal women in backward districts of Jharkhand. This initiative had been a challenge due to Jharkhand’s poor HDI reflecting structural poverty, systematic exclusion and social disintegration among marginalized community such as women, tribal in a caste based feudal economy. By initiating SHGs of poor women and building their capacity through training and exposure visits, the ICPRD project succeeded in forming micro finance networks. 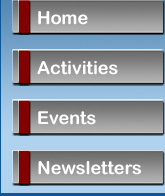 Also savings habits initiated within groups.